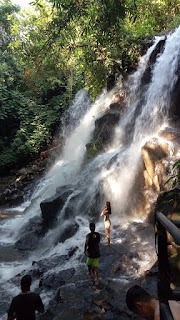 Kantolampo Waterfall (or Kanto Lampo) is located in Gianyar Bali. The roar of water falling on the rock is a natural sound that is suitable for calming down. And when you sit in a comfortable position in a quiet and clean place, it can help calm your mind, try to get rid of all the negative thoughts and anxieties that might bother you at any time. Focus your attention on your voice, feeling, and breathing. With every breath out, let stress and anxiety be hidden in your body and mind free. And enjoy the tranquility of meditation in this waterfall. The water comes out naturally from the ground through the sacred stone statue to the purification pool.